Pine shavings and related products are by far the most common bedding material used in the pet industry. Pine shavings are easily accessible, are processed and packaged by numerous pet supply companies, and are sold at almost every store that carries pet products. 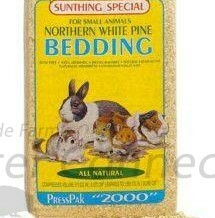 They are inexpensive to purchase compared to almost all other forms of bedding. Pine shavings do a relatively good job of absorbing urine. Most brands are comfortable for small and large animals alike. The comparative ease of use, safety, and cost factors make it the top choice for many animal breeders and owners alike. Some veterinarian professionals and pet owners discourage the use pine shavings and their derivatives. Pine shavings do not contain the harmful plicatic acid (primary form of irritation in cedar) that cedar shavings have, but contain high levels of abietic acid, (an organic compound found in many trees) which when not heat cured; can cause similar problems after exposure. Necropsies on animals having respiratory distress from their bedding may also show liver distress and fluid in the lungs. Pathogens are generally not seen. The quality of shavings varies from manufacturer to manufacturer. The size, shape, and texture of the chips play an important part in the effectiveness and safety of the product. Most bulk packages of shavings sold for livestock are not as meticulously dried and packaged as the smaller bags sold for smaller pets. Some shavings are dusty and they can make you and your pets sneeze or cause respiratory problems. Symptoms of respiratory disorders can be loss of appetite, wheezing, sneezing, loss of mobility, bright green stools, and eventually death. Many breeders do not have feasible sources for other bulk bedding than pine. When using pine shavings, it is essential to make sure they are kiln-dried. The hedgehog’s cage will need to be well-ventilated and frequently cleaned. Other types of shavings contain lower amounts of aromatic hydrocarbons and are less toxic. Aspen shavings are relatively safe bedding material. It is relatively inexpensive and available at most pet retailers. Aspen is typically a better choice than other wood shavings. This form of bedding is often reported to be better for hedgehogs with skin sensitivities, but hedgehogs can have sensitivities to this bedding, as well. Aspen is not as absorbent or as effective at odor control like many other bedding options. The texture is often course and rough and is therefore not as comfortable for many pets as some of the other options. Some aspen is so rough that the wood is almost a spear-like splinter, which can injure the hedgehog’s eyes when they are curling into a ball. Large, flaky shavings are softer and ideal, but are extremely difficult to find. Some hedgehog entusiasts believe that aspen is very good for skin allergies. Aspen might be good for some hedgehogs, but is not true for all hedgehogs or other animals. Pelleted pine is fast becoming a bedding of choice. The benefits outweigh the negative aspects of the bedding when evaluated against effectiveness, accessibility, costs, and comfort. 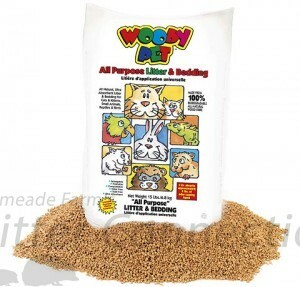 Pelleted 100% pine horse bedding or pelleted pine kitty litter is the best option for hedgehogs. There are different brands of wood pellets, and it is a good idea to evaluate the brands individually before use. Not all wood pellets are 100% pine and some may contain a blend of soft woods. Some types of wood can be irritating to your hedgehog. 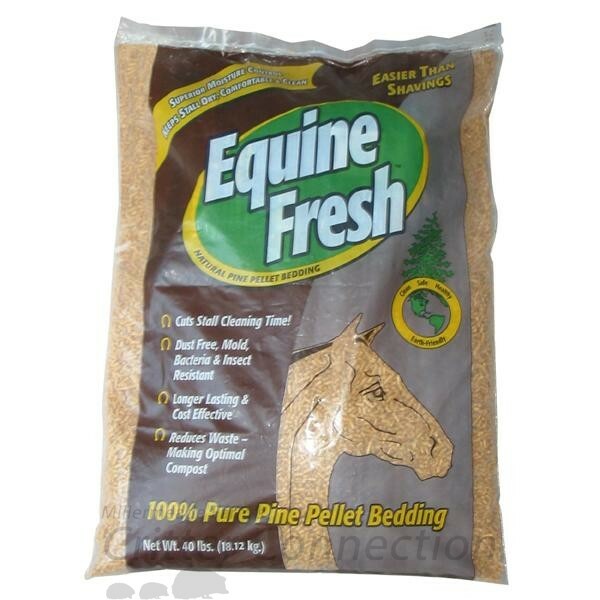 The popular horse bedding products are Equine Pine and Woody Pet. Planetwise Products have several other versions of Equine Pine which are equally as good that may be found in your local pet store. Pestell also has a brand of pelleted pine that is only slightly different than Equine Fresh. “Raw White Soft Wood Shavings and Sawdust undergoes extreme processing which extracts most of the resins, oils, tars, acids and water from the wood fiber. Exiting the milling process the product is completely sterile in granulated form and has become an extreme absorbent. Looks like, but does not taste like Granola. We have eliminated the Dangerous Aromatic Hydrocarbons. Brands of pelleted kitty litter include but are not limited to Gentle Touch, Feline Pine, and Cat Country (Critter Country) organic litter. 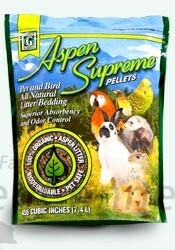 Aspen pellets are another excellent option and are found in many pet stores. Aspen Supreme is a common brand of pelleted Aspen. It is important to note that hedgehogs have a tendency to eat things that are unfamiliar to them. To minimize this risk, stick with the same type of bedding that the hedgehog has been using. For example, if your hedgehog was raised on pine, use pine pellets. If your hedgehog was raised on aspen, use aspen pellets. When pellets get wet, they absorb the moisture, which could cause intestinal blockage and death. A 4” crock will help keep the bedding out of the food. The biggest benefit of the wood pellets is that it draws the moisture out of feces eliminating much of the odor. It breaks down into a sawdust-type material when it gets wet. The finer dust tends to settle to the bottom leaving the larger pellets on the top. It is fairly easy to spot clean without cleaning the entire cage. Only the dirty areas need to be cleaned instead of the entire cage and therefore allows you to clean the cage less frequently. Another big benefit is that this bedding does not stick to your hedgehog the way shavings do, so you don’t have bedding all over the floor around your hedgehog’s cage. Should the hedgehog eat a significant amount of the bedding, it can cause very serious problems such as intestinal blockages. It may become a little dusty if a majority of the pellets are broken down. Again, since this is a wood product, there is some concern about toxins within the wood. Made by the makers of CareFRESH. A super low aromatic blend of hemlock, spruce, and fir shavings. Super Shavings absorbs 9 times faster than hemp and 57% more liquid than aspen. What it means for small animals is that it is the best shaving available for absorbing liquids faster and for superior odor control, wicking away moisture, keeping pets dry with less frequent bedding changes. The special blend of kiln-dried hemlock, spruce and fir has 89% less extractives of aromatic and resin compounds found in pine and 79% less than aspen. A lower aromatic shaving gives small pets a healthy environment while minimizing potential health risks associated with aromatic & harmful resin compounds.